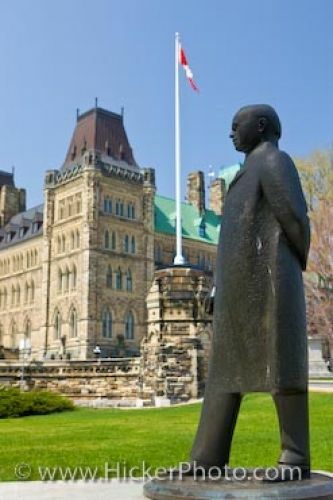 William Lyon Mackenzie King statue stands on the grounds of the East Block of Parliament Hill in the city of Ottawa. He was the 10th Prime Minister of Canada from 1935 to 1948. Parliament Hill in its beautifully detailed Gothic Revival architecture stands in the backdrop. The Canadian flag flies proudly on the stone wall behind the statue. Statue of William Lyon Mackenzie King (1874-1950) in the grounds of Parliament Hill back dropped by the Centre Block, City of Ottawa, Ontario, Canada. William Lyon Mackenzie King statue stands on the grounds of Parliament Hill in the city of Ottawa.